I first heard about this microphone from Richard Cleveland over at Naked Ape Productions during one of his Podcast U panel discussions. I mentioned this microphone to my personal friend, Michael Lawshe, who is an expert in all things audio (and multi-Emmy Award winner) and he happened to drop one by when we met for dinner last night. 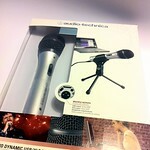 The microphone package include the mic itself, a mic clip and small plastic mic stand, an XLR microphone cable and a USB cable. As you might notice from the cables included, the ATR2100-USB, has a special feature which I have not seen in many other microphones. 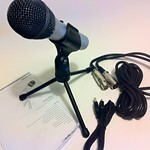 Instead of being a USB-only mic like the Blue Snowball or Rode Podcaster, the ATR2100 includes connections and electronics so it can be used either as a USB microphone connected directly to your computer with out a mixing board or as a standard dynamic microphone connected via XLR to a mixer. 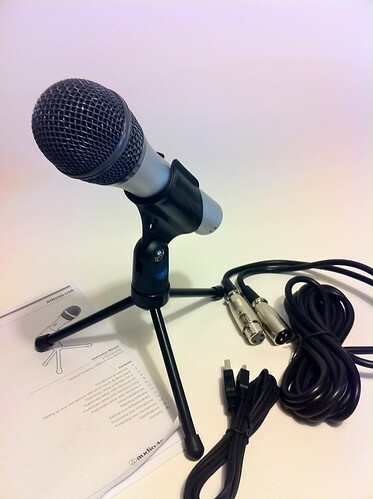 This dual connectivity makes this a great mic for those who are just getting started in podcasting or other audio recording and yet allows them to step up to a mixing board and other equipment while still using the same microphone. Additionally, when recording with USB-only microphones, real time monitoring of your recording can be a problem due to the USB induced processing delay. 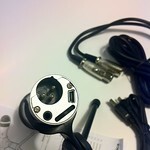 The ATR2100-USB works around this issue by including a headphone jack directly on the microphone itself, so you can easily monitor in real time even when connected via USB. Other USB microphones have included this much needed feature in the past, such as the Rode Podcaster, and it is great to see other manufacturers alleviating the monitoring issue with their designs. I know for myself that it is very important to be able to monitor myself as I record. It helps me to catch mumbled words, overly fast speech and poor pronunciations which I might not notice otherwise. As a demonstration, I have recorded this blog post as an audio podcast, too, so you can hear the microphone in a real world situation using both the USB and XLR modes. Everything up to here has been recored using the USB connection on the ATR2100. Now I will switch to the XLR connection using my small mixing board. As with any handheld mic, shock isolation js important. You don’t want to pick up any noise from your hand on the microphone itself. This is often where many less expensive microphones and recorders with built-in mic fail greatly. As you can hear, I am moving the microphone around in my hand and while it is picking up a bit of noise, if you hold the mic firmly you might not notice it at all. 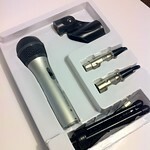 The included plastic mic clip and tabletop mic stand is enough for most beginners to get started, although most would probably want to move up to a more robust, metal, stand fairly quickly. Unfortunately, the headphone level form the microphone was at a very low level for my own personal tastes. I would prefer much more volume when recording and playing back what I have recorded. The mic has a headphone volume control, but it did not seem to the effect the output volume much at all. Instead the volume control seemed to be trying to change the overall volume on my Macintosh. The recording level was quite good even when placed on a desktop at some distance from my mouth. If you want more input level, of course, you can move closer to the mic although then you would want to use a pop filter cut down on the popping sounds of consonants and plosives like P’s and B’s. In this podcast I have used the mic at a fairly close proximity and included the use of a pop filter. Based on my short time with the microphone, and recommendations from others, I would consider this a great microphone for its price. Amazon currently lists it for around $40 US. I have been impressed with the overall recording quality even here in this rough demonstration. I haven’t taken any time to really adjust the microphone in any way, but simply plugged it in, adjusted the recording level and made this recording using Apple’s GarageBand software. If you’d like more information on the ATR2100-USB, you can find links not the web site as part of this blog post. Visit DouglasEWelch.com/newmedia/ to find them. If you have any questions about Peter’s podcasting equipment, please drop them in the comments or in the Facebook Podcasting Community. This entry was posted in Audio, Gear/Equipment, Hardware, New Media, New Media Gear, Podcast, Podcasting, Production, Show, technology. Bookmark the permalink. 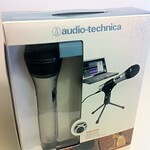 I am having problems getting good, consistent sound through this microphone while using garage band. Is there something that I could do to improve the volume? I’ve changed the levels in System Preferences, as well as messed with the levels in Garage Band. I took my laptop to the Apple Store and they weren’t able to do anything for me. Everything I see online indicates that I can just plug the mic in and start recording, yet I’m not finding this to be the case. I have had issues with low levels for almost all USB microphones and never really found a good reason for it or a solution. Some are better than others. It could be an issue with USB drivers or perhaps an over-protective manufacturer who figure it is always better to have lower levels rather than distortion caused by too high an input level.